This site is officially closed, but I will keep it up so fellow F! fans can find some pictures and faworks of their favorite characters. The fan-club section of this page has moved, it is now located here. Sorry for having to stop taking names myself, but I don't have much time for maintaining. :( Thanks Joe for helping me out! If you'd like to write to the Cartoon Network to say you want them to continue airing the show, please visit the D.E.X.T.E.R. to find the address of where you can write. Check out "The Hall of Nifty Things to Know"
If you'd like, you can also stop by one of my homepages. Thanks to everyone who contributed to this site. 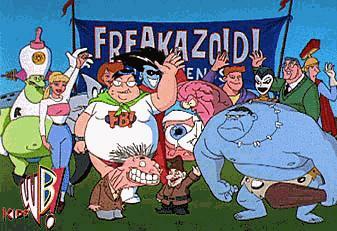 Disclaimer: Freakazoid! is copyright Warner Bros. All the images are used without permission. Please do not abuse this page, I didn't have the permission to make it.